The magnificent Killarney Plaza Hotel is undoubtedly at the top end of the 4-star bracket, offering all visitors a truly luxurious experience thanks to luxury extras including the finest wood, marble and fabrics. The stylish, spacious rooms range from the excellent classics to the opulent suites, all of which are designed to marry the principles of elegance, convenience, comfort and sophistication. 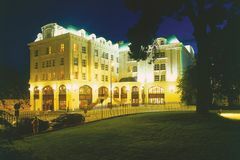 The standard of the accommodation is reflected in the array of dining, leisure and relaxation options, while the hotel also boasts a terrific situation in the heart of Killarney, close to all the action. With the myriad of outstanding golf courses within striking distance of this charming town, the Plaza is the ideal base for a Killarney golf tour. At the luxurious Molton Brown Spa, visitors can choose from a wide range of health and beauty treatments. These therapeutic options are designed along seasonal lines to reflect the individual's needs during different times of the year. What's more, the Spa makes use of the sumptuous Molton Brown range of products. In the leisure centre, guests are free to use the 15-metre swimming pool, sauna, Jacuzzi, steam room and well-equipped gym. The Plaza has three separate restaurants, including the formal Petrus, the excellent Grand Pey, and the relaxed Mentons. Champers piano bar is an elegant choice for a cocktail bar, while the extraordinary Café du Parc is actually 5 bars spread over 4 levels.